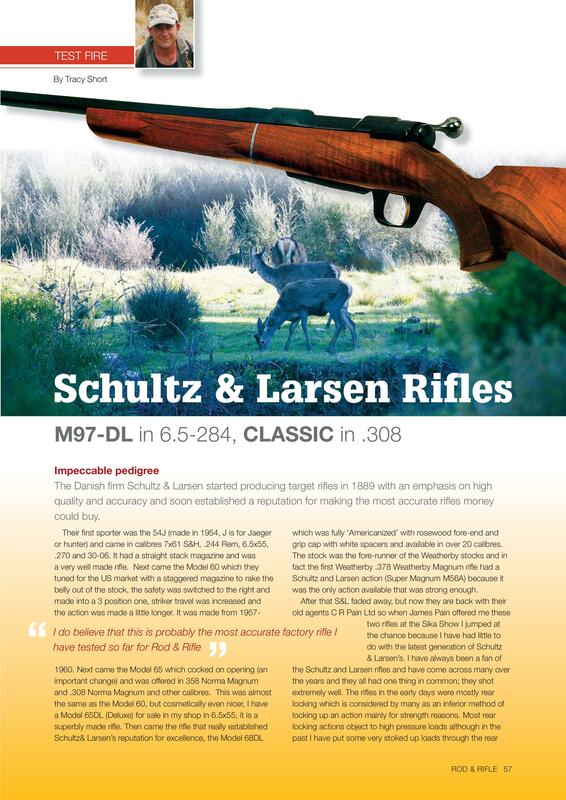 Ihave to say I was like a child at Christmas when the test rifle arrived from Alan Rhone, which distributes Schultz & Larsen (S&L) rifles. 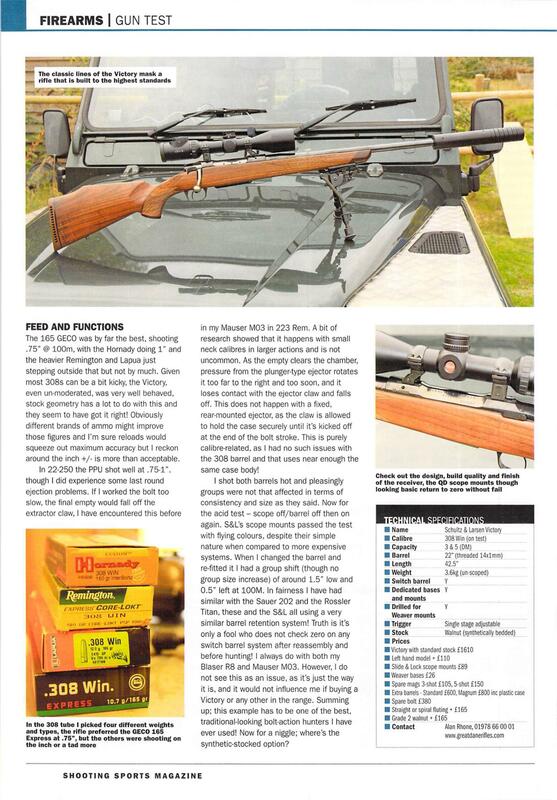 I have reviewed the Classic version and the smaller Legacy version — which was so good I bought one — so the big brother Victory rifle was eagerly anticipated. 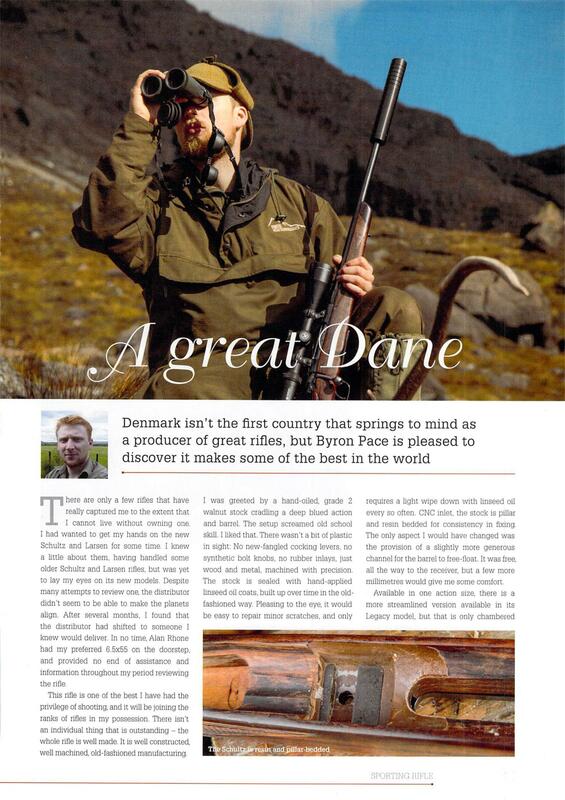 S&L comes from Denmark and has a long history of producing superiorgrade rifles, not only for hunting but also for target shooting. 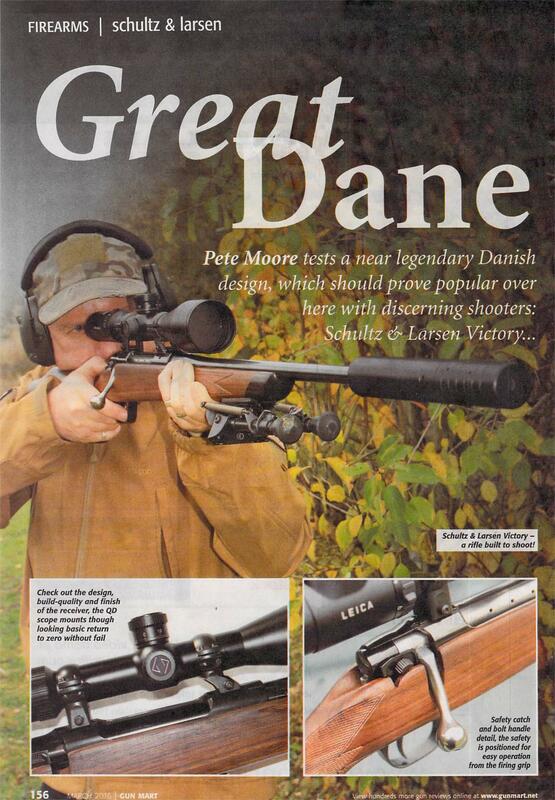 Its barrels, all made in house, are legendary for their accuracy and hard-wearing nature, which have made them favourites with shooters of all disciplines. 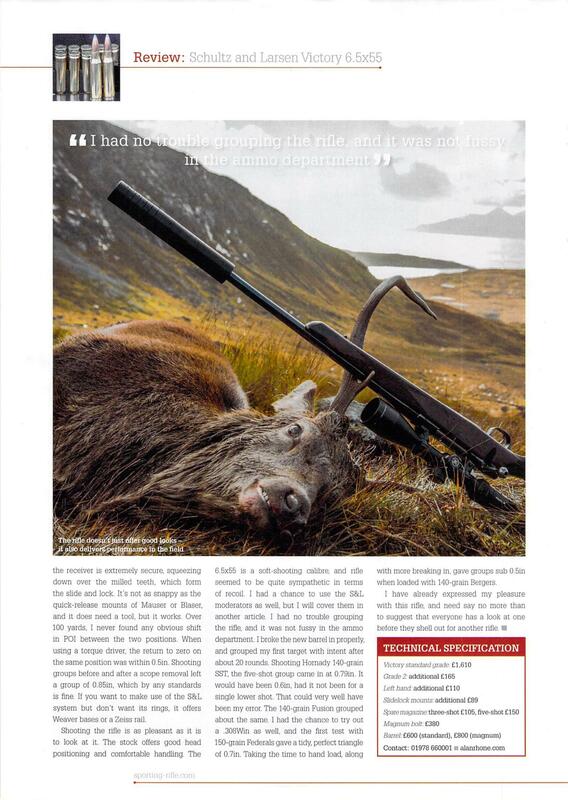 The Victory is a premium rifle that exudes quality. It harks back to that generation when a gentleman’s handshake was his bond and gunrooms smelt of worn leather and Youngs 303 oil. It has a well-designed stock with an excellent bedding system for enhanced accuracy potential, and upgrades in walnut quality are available. 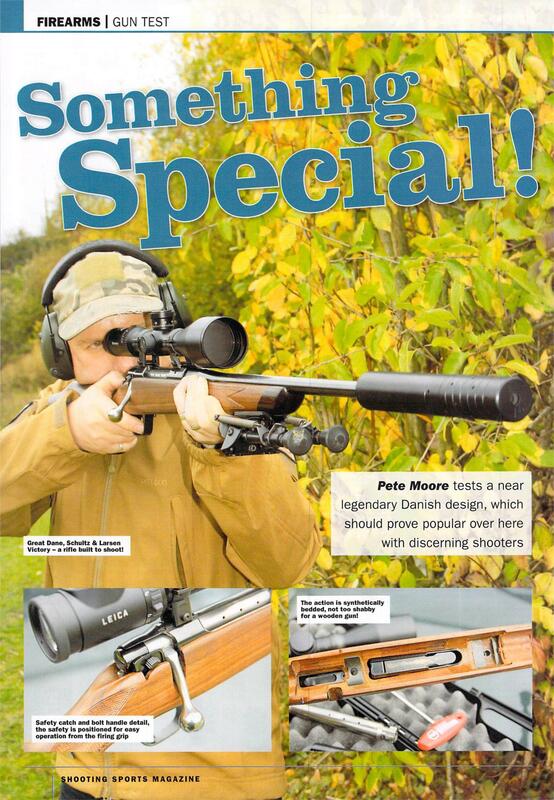 The barrel is removable for a calibre exchange and the bolt-action system is silky smooth and has a detachable magazine. I am looking forward to testing this one. First, let’s look at the stock because this really catches the eye. 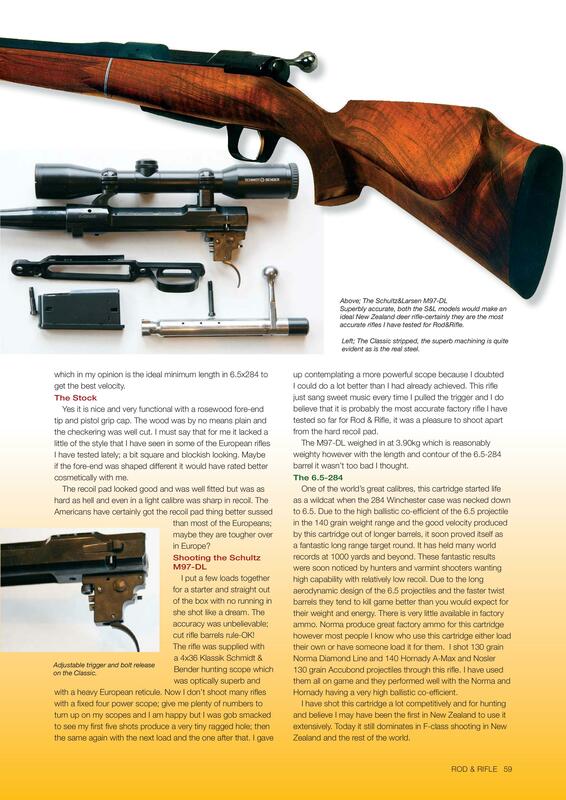 Usually supplied with a standard grade for £1,865, this rifle came with the grade 5 stock for £2,250 extra — a lot but what a piece of wood. Regardless of walnut quality the fit, form and finish are the same. The beauty of the Victory’s stock is not only skin deep as the traditional linseed oil finish is impeccable and practical. There is a long, slender foreend that features a rosewood-capped tip with rearward slanting bias, which totally free-floats the barrel. As with the pistol grip, the chequering is really well executed and provides a proper grip with well-defined, prominent cut diamonds. The pistol grip too is well raked for a comfortable natural hold and excellent palm swell that guides your hand to the same position, and therefore pressure and grip, making for a consistent shot. recoil pad that performs the duty of grip and looks good. Best of all is the bedding system: take out the action and — voila! — the pillar bedding to the stock screws is further enhanced with a synthetic bedding compound. 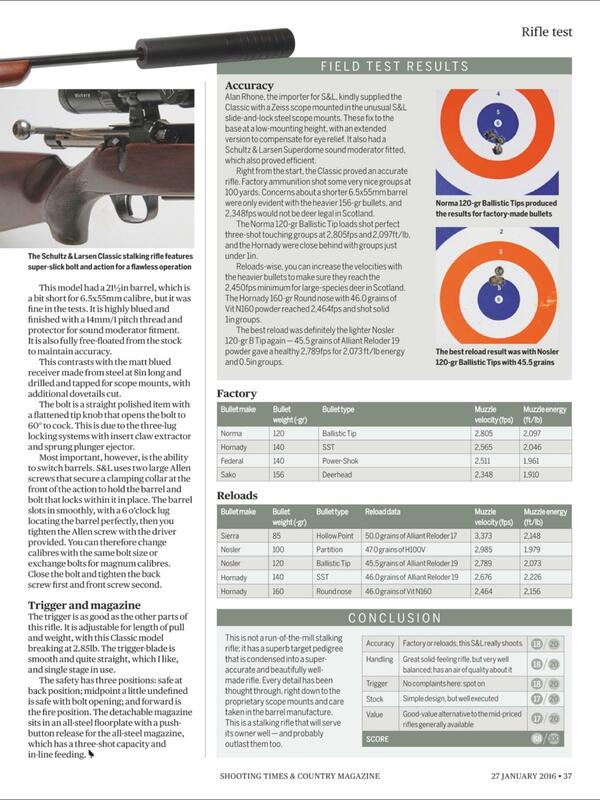 This ensures that the action is solid in the woodwork and so shot-to-shot accuracy and consistency is maintained. It is good attention to detail from S&L. feature. The barrel is retained by two screws in a clamping system that necessitates the bolt to be removed and stock detached. This allows the barrel to slip out and a different calibre to be inserted. You can swap between the same bolt size — from .243 to .30-06 — but magnum calibres will require an additional bolt. 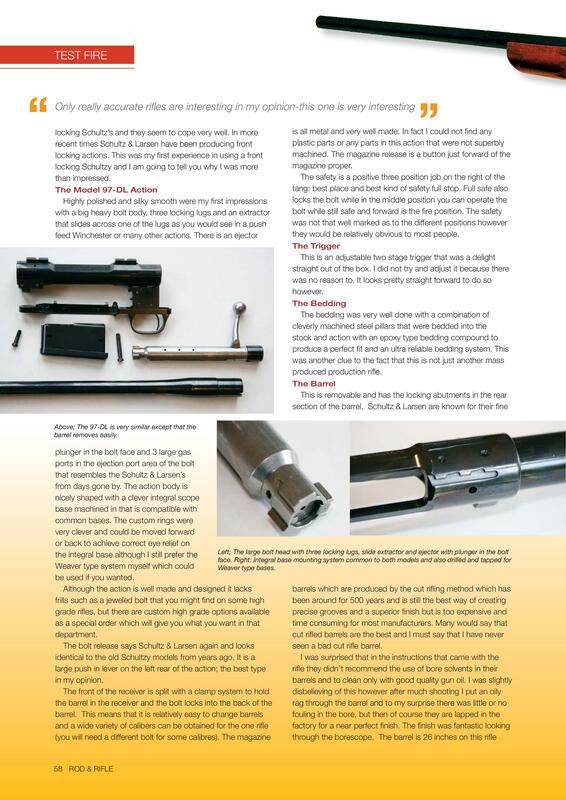 Standard barrels are £690, magnum are £940 and magnum bolt is £375. 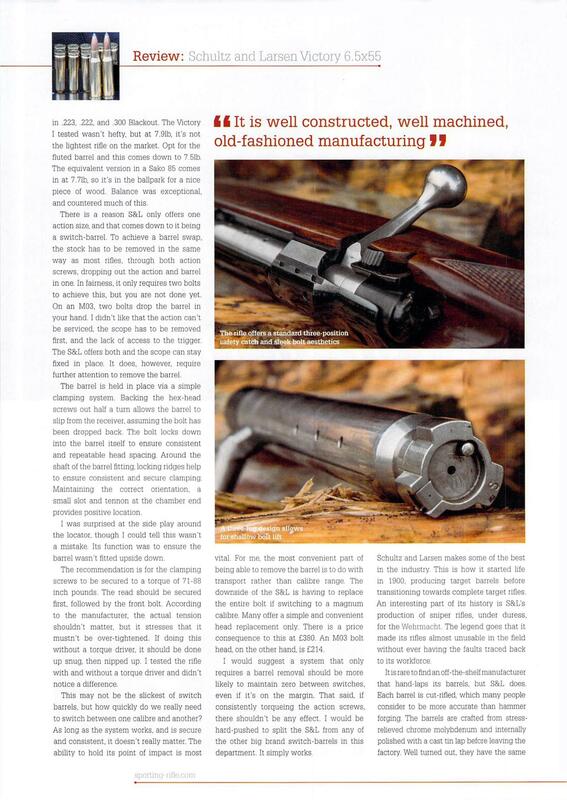 A small key at the base of the barrel ensures alignment and the fact the bolt locks into the barrel ensures a consistent head space. 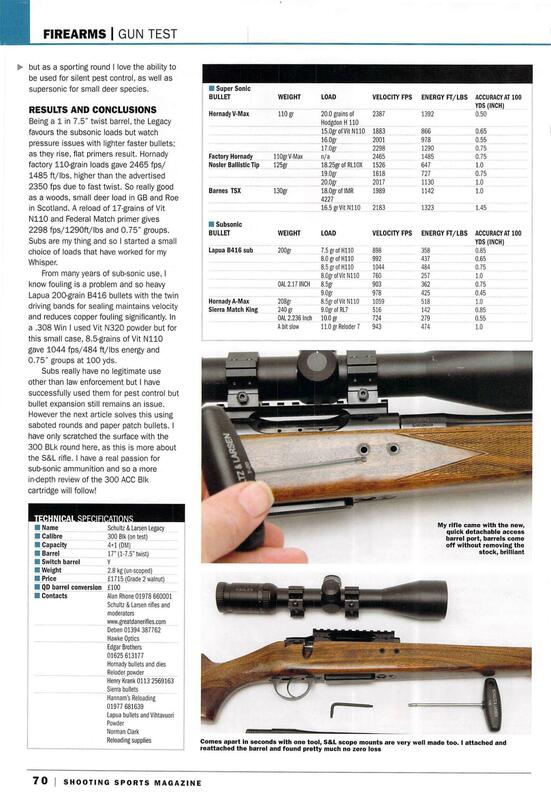 This is handy if you want a .243 for small species and a .30-06 for larger or African plains game, and is cheaper than two complete rifles. The barrel is 23.5in long with a 0.635in outer diameter at the muzzle, which is threaded with a 14mm/1 thread. As with the action, it has a mirror-blued finish with hardened chromoly steel beneath. 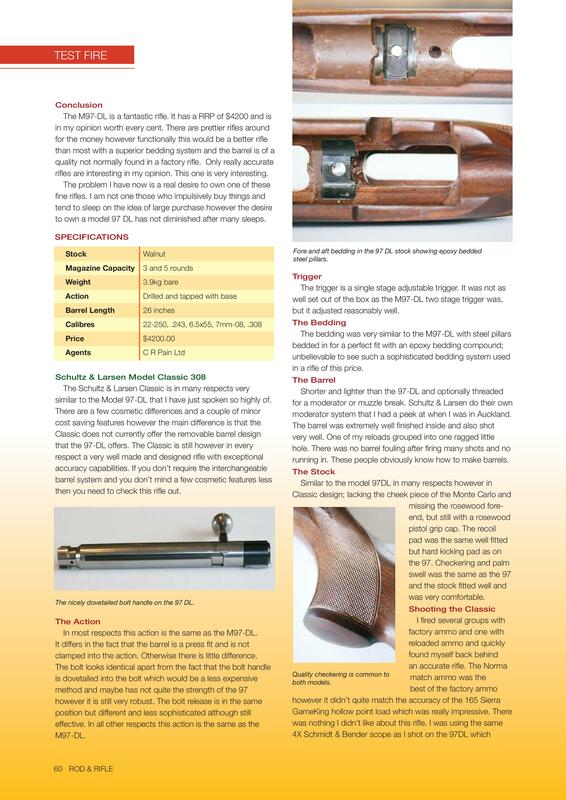 S&L made its reputation on matchaccuracy barrels and the Victory does not disappoint. 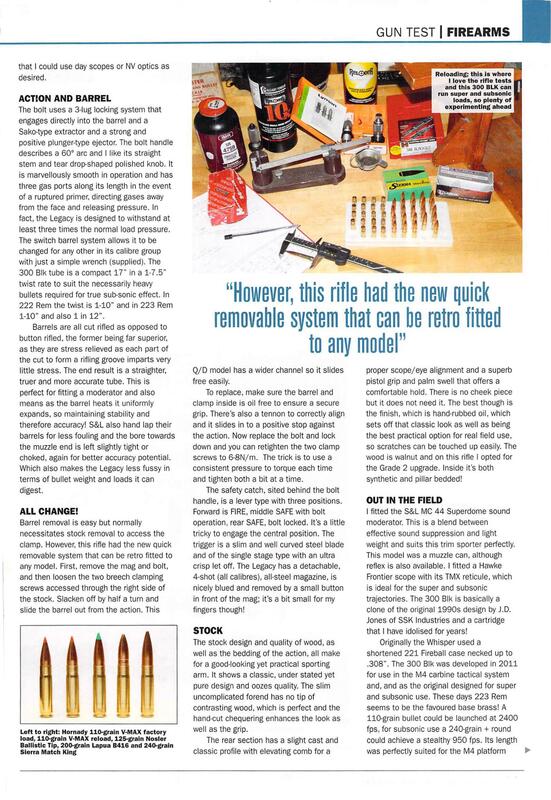 Most manufacturers use button-rifled barrels that are cheaper and faster to make. 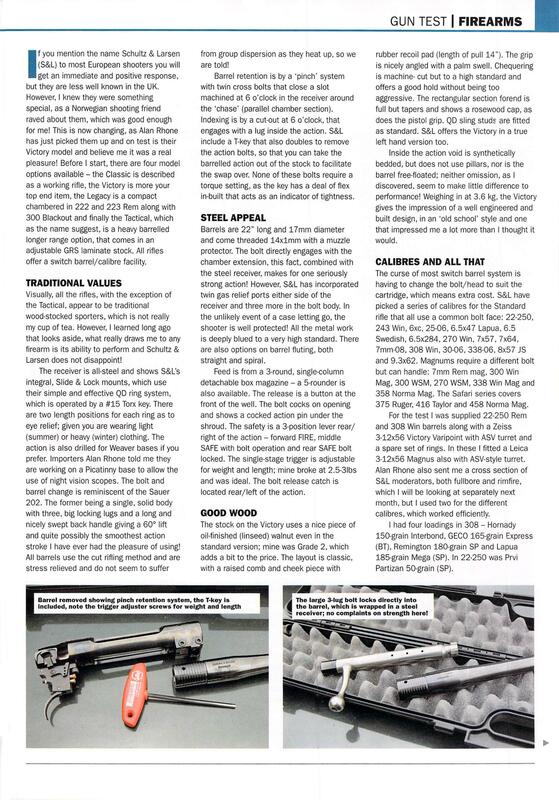 S&L does it right and cuts each rifling land for a precise rifling profile, depth and correct twist rate: in .30-06 it is 1- in-10in. Best of all, the barrels after machining are all handlapped to remove burrs, marks and imperfections so the bore is as good as it gets. The bolt is large but has a bright, polished finish and three locking lug arrangement. 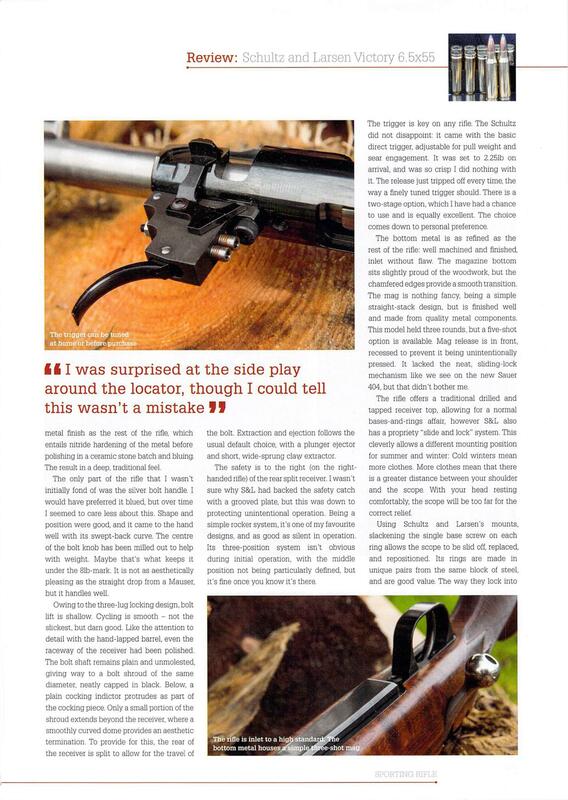 This has two benefits as the bolt is incredibly smooth to operate and the three lugs allow a shallow bolt lift to disengage at a lower angle, so it is super-fast too. Extraction is achieved by a large single claw sited in the lower-right locking lug and positive ejection is via the sprung plunger in the bolt head. Equally as good is the detachable box magazine, well constructed from steel and holding three rounds of .30-06 ammunition. The safety is a three-position type: forward position is fire, central position locks the trigger but the bolt opens, and rearmost locks both bolt and trigger. It is silent and efficient. Best of all is the trigger. It uses a direct sear engagement adjustable for weight and pull set at 2.85lb. It breaks cleanly and with total prediction. 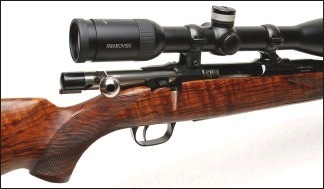 Scope mounting is via its own unique design that uses S&L’S slide and lock mounts, and the rifle came supplied with a Swarovski Z6 5-30X50 scope with ballistic turrets. The .30-06 is a diverse round capable of shooting light 110-gr bullets for foxes up to 220-gr projectiles for larger game. 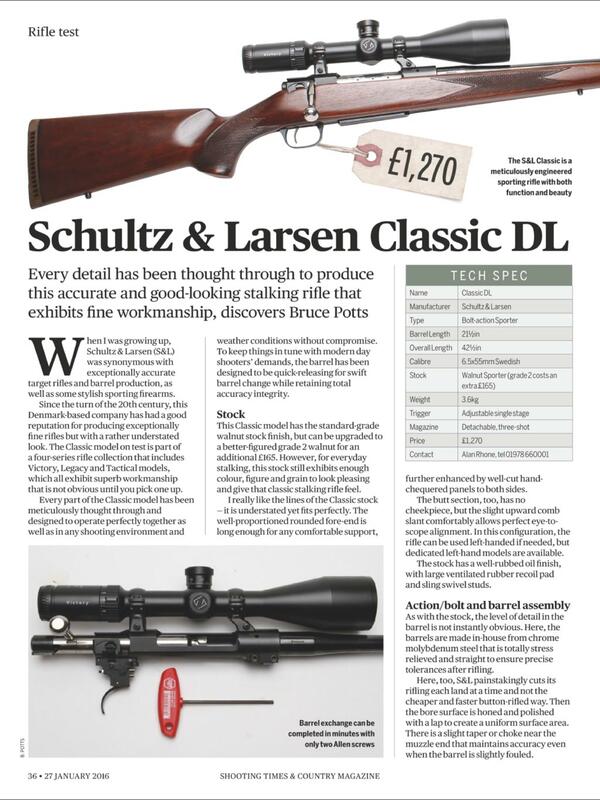 The accuracy of the Victory’s cut rifled barrel throughout the tests confirms S&L’S superiority in barrel manufacture. 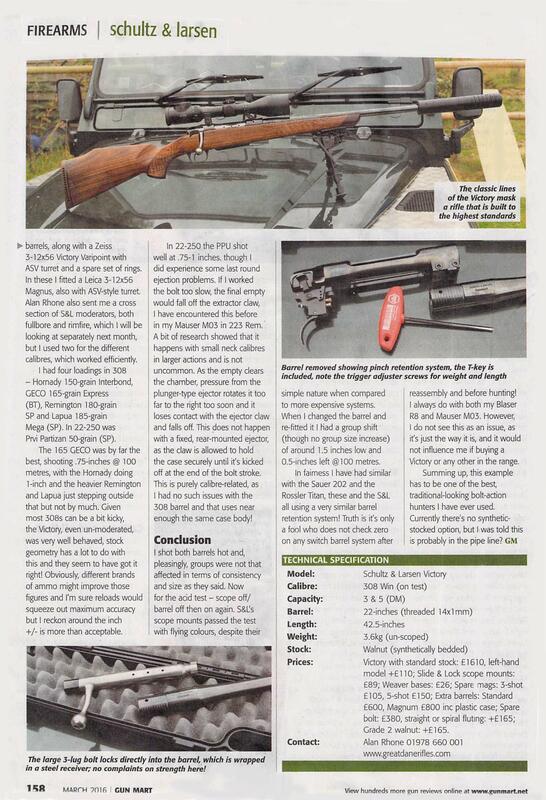 Loading the magazine is a breeze despite the release button being tucked away in the floor-plate, and the smooth bolt action is sublime. I ran a selection of factory ammunition first after zeroing in at 100 yards off the bench. 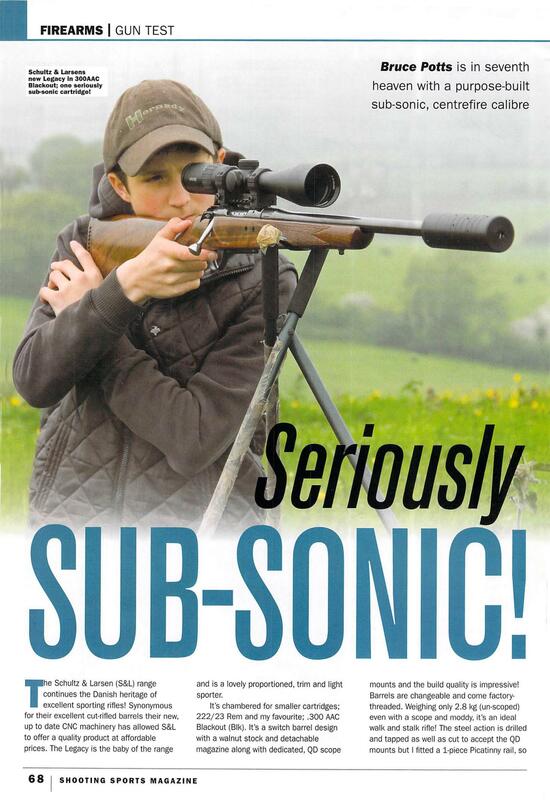 The Sako 123-gr Gamehead consistently achieved 0.85 groups with 2,987fps velocity and 2,437ft/ lb energy, so is ideal both for fox and small-species deer. 2,689fps for 2,891ft/lb and 2,596fps for 2,694ft/lb respectively, and all groups hovered around the 1in mark. 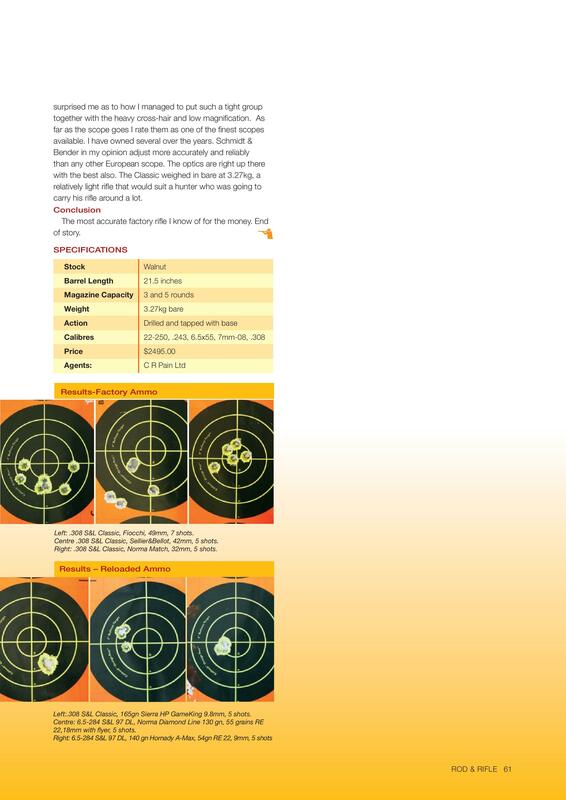 This is unusual for all the factory ammunition — the three shot groups did not exceed 1in at 100 yards and most were below 1in, which is very impressive. It seemed a bit superfluous to test some reloads but that is my guilty pleasure in life. So I tried a Hornady 110-gr V-max bullet for foxes with a load of 55 grains of Vit N150 powder. That achieved 3,172fps for 2,463ft/lb and 0.75in groups. A little more weighty and less frangible bullet was the 125-gr Sierra Pro Hunter, which makes it good for deer where a dependable expansion is necessary. This time a load of 52.5 grains of Reloder RL15 powder produced a velocity of 2,969fps and 2,447ft/lb energy and 0.5in groups. In fact, two shots almost went through the same hole and then one was slightly off, consistently. 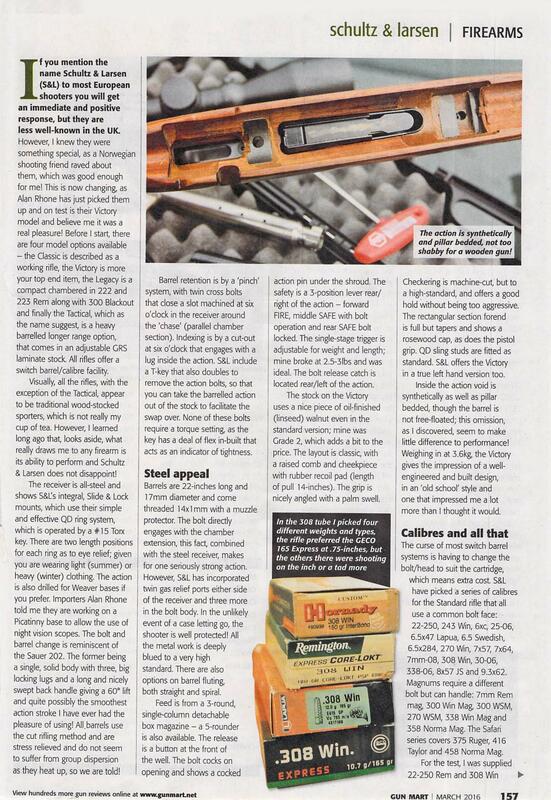 The heavier Hornady 165-gr Interlock too were very good and 54.0 grains of IMR 4007 SSC powder achieved 2,711fps and 2,693ft/lb and 1in groups.